Our Student Leadership Council supports the children, families, staff, volunteers and donors of Ronald McDonald House Charities of Alabama. Each year they host at least two fundraisers to support the house along with being a RMHCA ambassador at community fairs. This gives them the opportunity to meet other teens and share the mission of the house with the community while building leadership skills. In the fall the students host an Open House at the Ronald McDonald House. This is a perfect time to come visit and see what we are all about. The students provide tours of the house and answer questions on how to volunteer, provide meals, help with our recycling program or with our special events. 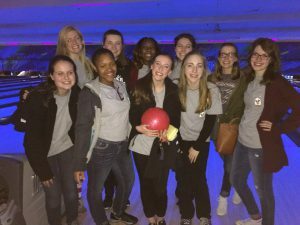 The Student Leadership Council will host their annual Bowl-a-palooza event at a local bowling alley. Tickets include unlimited bowling, unlimited soft drinks, shoe rental and a t-shirt. The students plan fun contests and raffles to keep everyone entertained throughout the evening. It’s a fun night for a great cause!